Hi there, and thanks for coming by to read my review of the Nikon RifleHunter 1000 Laser Rangefinder. Nikon makes some fine products, and this model comes in with the promise of a device that will make determining accurate ranges easy, whether you’re using a bow, crossbow, or rifle. Let’s see how it stacks up. Nikon has built this model to give you accurate ranges from five to 1,000 yards. 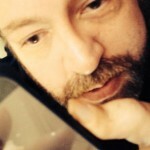 Now understand, that maximum range only really applies to large, highly reflective objects. Deer aren’t considered large or highly reflective. In real-world situations, you can probably expect to get an accurate range on a deer from as far away as 600 yards. When you do get your range, it’ll be displayed in 0.1-yard increments, and should be accurate to within half a yard. How Easy is the Riflehunter to Use? Some people are big fans of using a single button to do everything on a rangefinder. I’m not. I think single-button operation is fine for simple rangefinders, but when you have a plethora of options to choose from, it’s good to break those down into a mode button in addition to a power button. With that said, the RifleHunter 1000 succeeds in keeping ease of use at the forefront of the design. The functions and modes are separated into two buttons, one to power on the unit and the other to change options. Both buttons are large and easy to use, even if you are wearing gloves. This rangefinder, unfortunately, utilizes multicoated optics instead of fully multicoating them. The 21mm objective lens provides you with 6X magnification, and the rangefinder’s field of view is a generous 394 feet from 1,000 yards. For eyeglass wearers, the device offers diopter adjustment and an 18.3mm eye relief. Nikon is solidly in the lithium CR2 battery camp, unfortunately. I don’t really have anything against these power cells, other than their availability. When you’re in more rural areas, like where deer hunters tend to go to find their trophies, CR2 batteries can be hard to find. Nikon does, for its part, include one in the box. I just recommend buying a spare in case you need it. With that said, the device’s power consumption is quite good. The unit powers off after eight seconds of inactivity, and I’ve been using mine for almost a year with the same battery. Make no mistake, this is far from a simple rangefinder. Nikon has incorporated its ID technology for determining true distance to a target, taking into account the angle for your shot. It adjusts for up to plus or minus 89 degrees of slope, actually, which leads the industry. You’ll also be able to choose between First Target and Distant Target Priority modes, allowing you to tailor the rangefinding capability for a variety of terrain and hunting conditions. Perhaps the nicest feature, though, is the display itself. The readout automatically changes from a gray LCD display to an orange LED reading, depending on the lighting conditions. This makes this rangefinder much easier to use in low-light conditions. What’s the Light Gathering Capability Like on the Riflehunter 1000? Since the optics are just multicoated, and not fully multicoated, you won’t get the most possible transmittance out of the rangefinder. Still, this model is quite useful even in dawn or dusk conditions, and I’ve successfully taken down several deer in those darkened lighting situations. My only complaint, really, is the amount of glare the rangefinder suffers from. If you’re going after smaller prey, it might be more difficult to find them in the display than you can with a standard monocular or pair of binoculars. We’ve already talked some about the optics, but let me point out that they are good, but not quite great. The focus, on the other hand, is quite superb. The Riflehunter 1000 quickly snaps into focus, without much delay at all. The housing on the Nikon RifleHunter 1000 is nicely coated in rubber armor, which provides a fair bit of shock absorption. Furthermore, the optics chamber is O-ring sealed and nitrogen-purged, making the device both fogproof and waterproof. Nikon does point out that the battery compartment isn’t waterproof, so don’t go dunking it in the lake. However, a heavy downpour of rain or a drop into a puddle shouldn’t hurt anything. 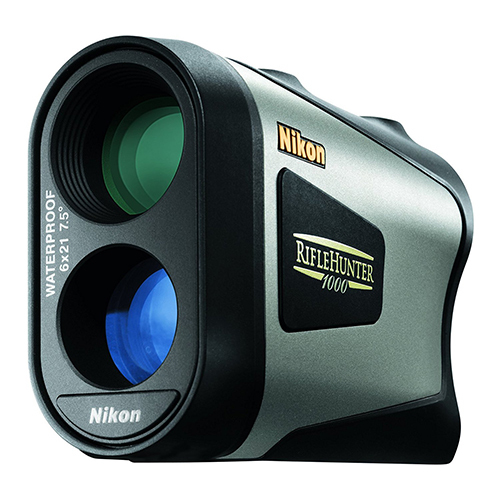 Thanks for reading my review of the Nikon RifleHunter 1000 laser rangefinder. This is an excellent model with plenty of wonderful, innovative features including a display that is as easy to read in the dark as on a sunny day. Unfortunately, it suffers from a bit of glare and uses a hard-to-find battery.